Once upon a time, presidential contenders and their political parties raised the funds needed to pay for the campaigns. How quaint. For the 2016 elections, thanks to the Supreme Court’s malicious meddling in the democratic process, corporations and billionaires have taken charge. These very special interests, who have their own presidential agenda, now put up and run their own private campaigns to elect someone who’ll do their bidding. So far, nearly half of the $400 million raised to back candidates of either party in next year’s race has come from a pool of only about 400 families. Two-thirds of that cash went not to candidates, but to corporate-run super PACs. For Republicans, over three-quarters did. 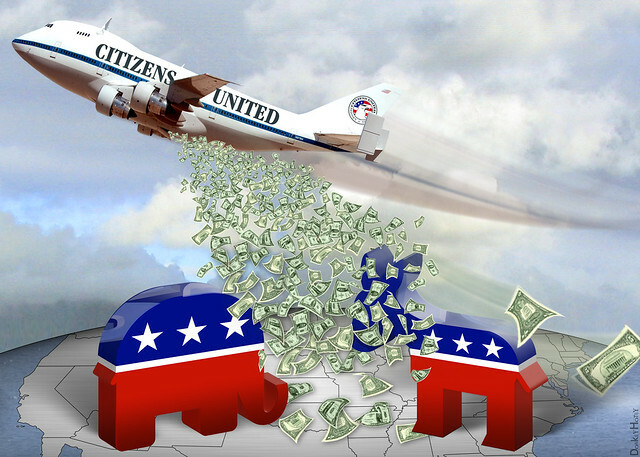 The reason is that the Supreme Court’s reckless Citizens United decision decreed that these “non-candidate” campaigns can take unlimited sums of money directly from corporations. Therefore, a very small number of wealthy powers can pour money into these murky political operations and gain unwarranted plutocratic power over the election process. Of the $37 million in the PAC backing Ted Cruz, for example, $36 million was pumped in by only three interests — a New York hedge fund operator, a corporate plunderer in Puerto Rico, and two billionaire brothers who made their fortune making fracking equipment. Dallas private equity investor Chart Westcott, one of these 400 mega-donors, assures us that this new system isn’t about buying candidates for corporate and personal gain, but “primarily [for] a love of economic freedom.” Sure — the “economic freedom” to pollute, defraud, exploit, rob, and otherwise harm anything and anyone standing between you and another dollar in profit.